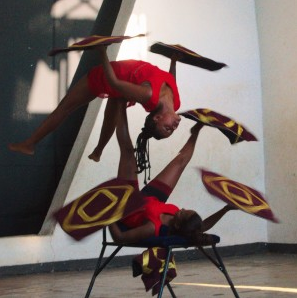 Home » Blog » Circus show raises more than $1000 for girl’s education! Link Ethiopia is partnered with SponsorHer!, a social fundraising platform connecting girls in Ethiopia with sponsors all over the world and leveraging the potential of expatriates and tourists. We are always happy to be work with people who are just as passionate about education in Ethiopia as we are. With the help of Fekat Circus, SponsorHer! were able to put on a wonderful show to many people and raise more than 1000 USD. Under the blue tent of Fekat Circus in the old centre of Addis Ababa, Piassa, adults and children impatiently wait for the circus show to start. Some minutes later, young acrobats jump, fly and roll over the scene, followed by talented jugglers and two funny clowns. The public holds its breath when two young girls climb up high under the circus roof just held by a simple rope and start doing breath taking acrobatics. Big applause sets in after each successful figure and even bigger so once the girls land safely on the ground again. 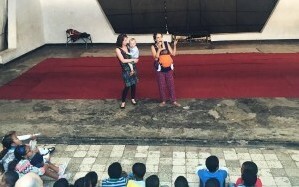 More than 150 people, mostly families, came to the magic circus afternoon last Sunday, 20thSeptember. Besides enjoying the wonderful show, they helped raise more than 1000 USD that will support four Ethiopian girls to attend Secondary School for the next school year. Habtam and Eman, selected and accompanied by our partner MYSisters in Addis Ababa, and Hamelmal and Martha, supported by our partner Link Ethiopia are among the best of their class, but their families struggle to support their school education. All four will start Secondary School this week in Grade 9. Secondary School in Ethiopia lasts 2 years and is followed by a two year preparatory class for university in Grade 11 and 12. You can learn more about them by clicking on their name above, and if interested sign up to support them during all of their Secondary School career. We greatly thank Fekat Circus for this wonderful show – circus art in its pure form. 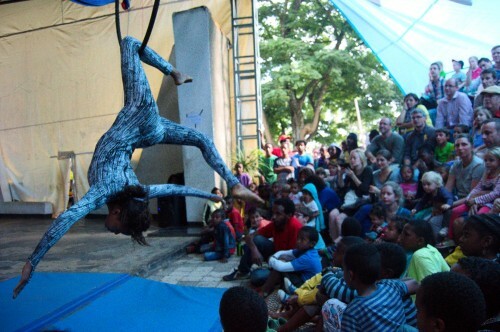 Fekat Circus enables professional and young artists alike to express themselves through corporal arts. 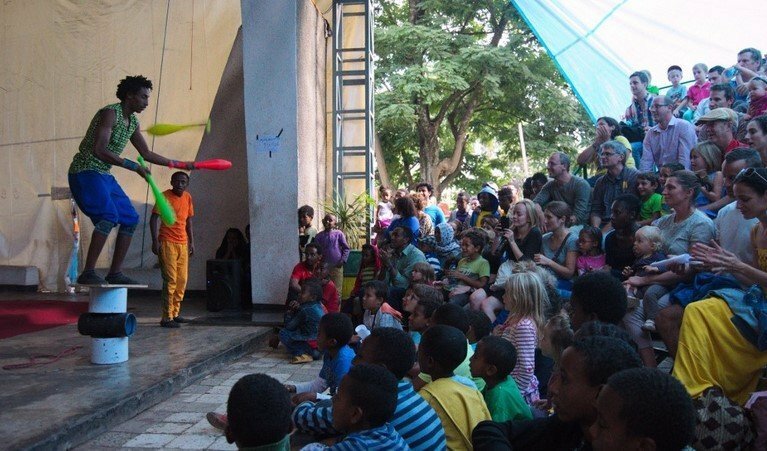 Besides its professional shows, Fekat offers as a social endeavour circus training to disadvantaged children in Piassa and brings joy through clownery to sick children. 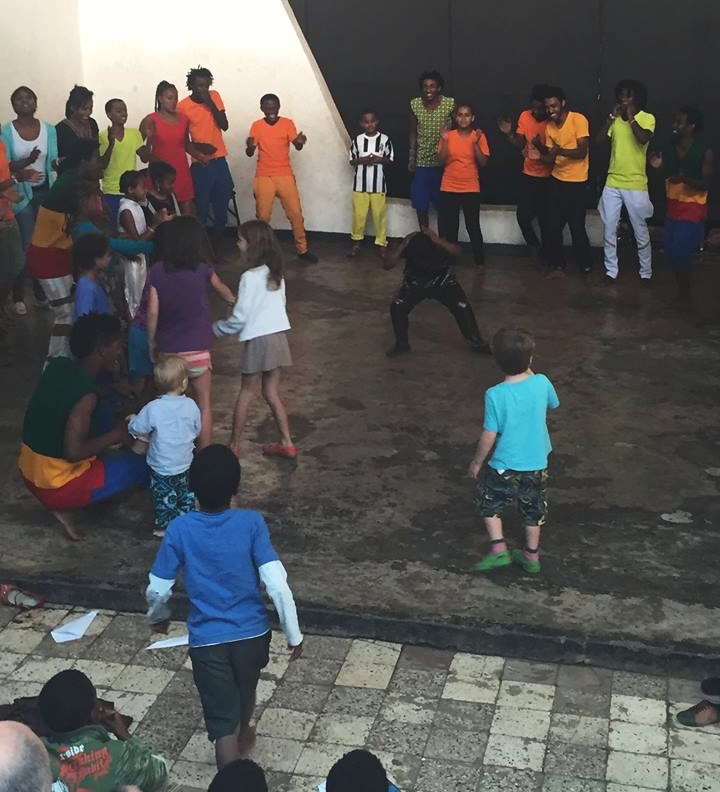 This joy also spilled over to the public last Sunday, when artists, children and parents alike joined into a common dance at the end of the show. Thank you everybody for coming and for your support of girls education! Next PostWhat’s life like in a refugee camp?